I’m a cookbook collector, and recently I added a new addition to my library. 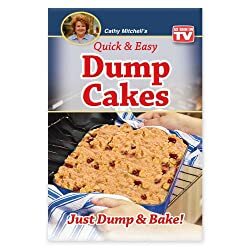 It’s called Dump Cakes by Cathy Mitchell, the infomercial queen. It’s a cookbook full of quick and easy dessert recipes, many of which only require you to “dump” a few ingredients (such as canned fruit and cake mix) into a pan before placing the whole thing in the oven to bake. The recipes allow you to create impressive desserts in a fraction of the time that it would take you to make them from scratch. In addition, they are fresher and less expensive than store-bought desserts. While I don’t mind searching online for recipes, I don’t keep my computer in the kitchen. Having physical cookbooks with easy to make recipes in my kitchen makes the work of preparing meals much easier. I also like that the recipes are straightforward. The recipes use easy-to-find and inexpensive ingredients (my local supermarket seems to always be holding sales on canned and frozen fruit). I can also say that my family really appreciates it when I prepare dessert rather than just hauling out some store-bought cookies or a pint of ice cream. There are a few things that you might want to consider before purchasing Dump Cakes. The first is that all of the recipes rely on prepackaged, prepared ingredients. While many people rely on these items, if you prefer to only use whole, fresh foods, this cookbook may not be for you. For example, some of the recipes use soda pop as an ingredient. In addition, some of the recipes also require some preparation such as mixing a cake batter. Right now, you can purchase the cookbook online. I recommend also purchasing the companion volume, Dump Dinners, and the nonstick skillet. The Dump Dinners book, as you might expect, offers similar recipes as the cake book. You just add several different ingredients to a cooking dish, cover and then cook. The skillet, on the other hand, is oven-safe and the perfect size for many of the dump cake recipes. In addition to all this, Amazon offers a very generous and liberal return policy with all of their sales.